There aren’t many vegetables that require a forklift truck come harvest-time. Grow yourself a championship pumpkin, however, and you may well have to resort to such heavy-handed tactics. Given the right cultivar, ideal growing conditions and a helping hand from us, pumpkins can reach truly epic proportions, with 1,000 pound fruits not uncommon – that’s the best part of half a tonne! The world record for the heaviest pumpkin gets smashed just about every other year. The current titleholder is Chris Stevens of New Richmond, Wisconsin, whose 2010 whopper weighed in at a hernia-inducing 1,810.5 pounds (821 kg). His secret? A heady (and closely-guarded) mixture of cow manure, fish emulsion, seaweed, plus good ol’ rain and sunshine courtesy of the Big Man upstairs. Those with a passion for growing oversized pumpkins tend to hold the exact secrets to success close to their chest. Indeed, there are shovelfuls of folklore and mystery surrounding pumpkin growing – usually laid on as thick as the manure used in the process! Some of the techniques behind medal-winning pumpkins are, quite frankly bizarre; I once witnessed a grower rigging up what can only be described as an intravenous drip to the base of one of his fruits. Delivered directly like this his super-rich liquid fertilizer would, he assured me, bring home the silverware from his local village show. While the pumpkins I grow are unlikely to ever reach record-breaking proportions, I at least manage to grow a few fruits every fall to carve a more-than-respectable Jack-o’-lantern in time for Halloween. Here, then, are my tips for growing a few decent-sized pumpkins. By now your pumpkin plants should be in situ and, hopefully, racing away. Soil that has been improved with a thick layer of incorporated organic matter will offer the best prospects for eye-popping fruits. Soil that’s rich in humus – any fully rotted material such as garden compost or animal manure – will hold onto more moisture during dry weather. Humus also acts as a buffer between waterings, maintaining steady and predictable conditions at the root zone. Consistent soil moisture is a must as a sudden influx of liquid after a particularly dry spell is liable to cause fruits to split. You can add more organic matter to the soil surface in the form of a mulch, locking in further soil moisture while providing extra goodness for trailing pumpkin stems to root into. It takes a lot of energy to swell a pumpkin, so plants need to be properly established before they set their fruits. 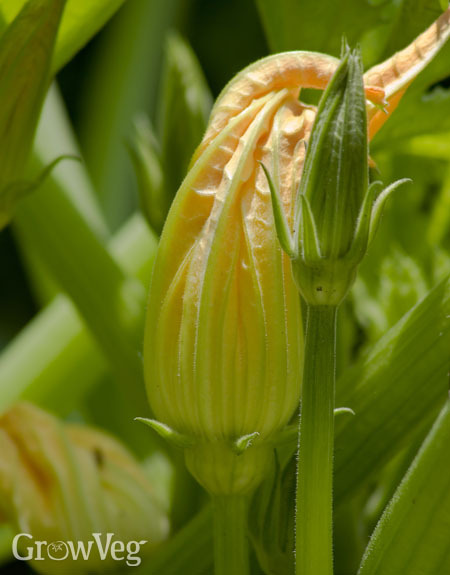 Plants should ideally have produced at least 100 leaves before pollination of the flowers begins. The leaves are the power generators of the plant, which means that the more leaves there are, the bigger the pumpkins will be. If bee activity can’t be guaranteed (for example if you are growing pumpkins within a polythene tunnel for the extra warmth) then it’s easy enough to pollinate the female flowers yourself. These are easily identified by the slight swelling immediately behind them; male flowers have no such swelling. Simply cut away the male flowers and peel back the yellow petals to expose the central stamen which contains the pollen. Now gently tickle the stamen onto the multiple stigma of the female flower. Nature will take care of the rest. Left to their own devices pumpkins will produce a heaving sea of green. For a more manageable plant allow just three primary stems to develop. Train each of these away from each other in opposite directions. This gives the laterals – the secondary stems that emerge from each of these primary stems – more room to grow. The idea is to minimize overlap of the trailing stems to keep plants open, ensuring better air circulation and reducing the disease risk. I thrust sticks into the ground to channel the laterals into clear areas of ground. Pinch the laterals out at the tip before they cross each other and remove any subsequent stems that try to develop from the laterals before they have a chance to grow. For good-sized carving pumpkins allow one fruit to develop on each of the primary stems. If you are after the biggest pumpkin on the patch limit fruits to just one per plant – allow three to set then cut away the smallest two to leave the dominant pumpkin to swell. Remove any further flowers to concentrate all the plant’s energy into your pumpkin. There’s an awful lot of advice flying about as to what to feed a pumpkin. I use nothing more than liquid seaweed fertilizer, watered on every other week. I also find that heaping soil or mulch over the axis where the fruit-bearing stems emerge from the primary stems stimulates more roots. These additional roots draw in yet more moisture and nutrients, giving a further boost to the pumpkin’s prospects. Not all pumpkins are born equal. While it may be too late for this year’s king-size fruits it’s worth making a note of suitable varieties for next summer. Any cultivar with the words ‘giant’, ‘mammoth’ or similar in its name gives more than a subtle hint that it’s game for supersizing. ‘Dill’s Atlantic Giant’ is arguably the most reliable heavyweight and is available both sides of the Atlantic and beyond. "I just started growing pumpkins this this season and they've reached 25-60 pounds is that good for my first pumpkin patch?" "Is that good? That's fantastic! That's a really healthy weight and genuinely impressive for a first attempt. Good job Tara!" "Do i need to pore any thing on the fruit to help it grow larger and if so what." "Hi Gary. You don't need to pour anything on the fruit - just feed the plant itself. I recommend liquid seaweed fertiliser - but any liquid feed that is high in potash should work well."